“Doesn’t generate property tax of (sic) sales tax revenue-leased to City Center For $1. The current proposal from the City Center provides half the parking revenue to the city, the sales tax generated by the parking, and an annual lease payment of $70,000.00. I find it very disturbing that this group would distribute something with such glaring inaccuracies. The group has a web site and I have posted on it a request that they correct the leaflet before distributing any more. There was a discussion on the RFP as part of Commissioner Chris Mathiesen’s agenda at tonight’s meeting. There were some minor tweaks but the council seemed united in its praise for the RFP. There was an agreement on the need to move swiftly and it appears that the RFP will be issued tomorrow with bids due in ten weeks (the end of September). There also appeared to be a consensus that the City Center should move forward through the required land use boards simultaneously. Our own local Shakespeare company performs Love’s Labor’s Lost in the City Park. Lary (yup. One R) Opitz directs. It opens tonight at 6:00. The company is very good about editing the plays and crafting the performance to make the language accessible. Many are put off by Shakespeare because of productions where the language is so dense and the delivery so fast that it is incomprehensible. Not so with our own local production. I have great sympathy for the owners of the Mouzon House. The restaurant business is extremely challenging. They have worked very hard to build an excellent restaurant whose reputation for the quality of its food and the courtesy of its staff is well deserved. I can speak from experience. It is clear that they feel profoundly threatened by the structure being proposed by the City Center and they have campaigned hard to block its development. In the course of doing so, they have played on many of the common prejudices. To begin with, the image of a parking garage for many of us, conjures images of cracking walls, dark smelly stairways, ominous and huge towers blocking out the light and huge, threatening edifices. There is also the image of a large, well funded, government agency ruthlessly crushing its critics and opponents. None of this is true regarding the City Center and its proposed structure. The first thing to understand is that because the City Center is a public entity they were not required to go through the normal zoning requirements. In spite of this, the City Center is pursuing the required approvals by the city’s land use boards as though they were a private developer. 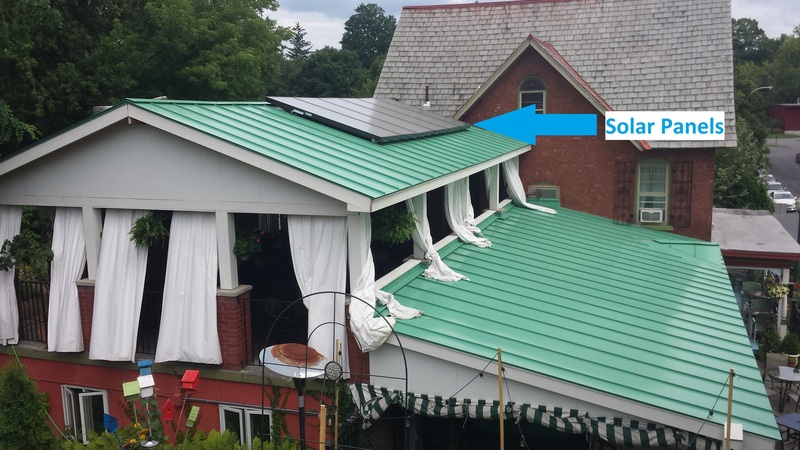 Then there is the issue of the solar panels on the Mouzon House. The panels are not photo voltaic. They are passive thermal panels meant to heat hot water. The Mouzon House installed these without the required building permits or the approval of Design Review. A reasonable person in looking at the timing of their construction and their circumvention of the required steps could conclude that they may have been installed as a strategy to throw a legal impediment in the path of the City Center. The fact that the ordinance regarding solar panels that the Mouzon House used has now been changed does not mean that the decision was retroactive as many of the City Center critics have maintained. In fact the City Center is still required to go through the Land Use boards for approval. This is not to say that the change did not greatly benefit the City Center and that their chances of success have not been improved. I have argued in a separate blog that this change has an important and beneficial impact for all downtown development. The fact is that the Mouzon House exposed the very serious problems with the existing ordinance. It is instructive that no landowner in the city core that would be affected by the change spoke against it other than the owners of the Mouzon House. If the change had been solely to benefit the City Center one would have expected that other landowners who felt they would be adversely affected by it would have come forward. Some have suggested that the City Center should have offered to put the panels on the Center’s proposed structure but because the panels are thermal and are meant to heat water, this was simply not a feasible solution. The City Center, in its negotiations with the Mouzon House, continues to discuss options that may help mitigate the impact of the structure to their business. It is important to put the project in perspective of the needs of the city as a whole. One of the principals of the Northshire Bookstore made an impassioned plea regarding the need for customer parking. This is the need most commonly expressed by downtown business owners. It is also critical to understand the importance of the City Center in sustaining the downtown. Most of us do not appreciate how difficult it is for merchants to get through the winter months. The conventions attracted to the City Center place thousands of people right in our city’s “center.” The recent expansion of the City Center means more attendees which means more people in town to shop and eat downtown. The planned parking structure is important not only to accommodate the increased volume at the City Center but will relieve the parking crunch for other downtown venues (including the Farmer’s Market) as well. So let’s look at what is really being proposed. Below are a number of photos meant to give people a better sense of the project. These are meant to expand on photos in an earlier blog that showed renderings of the actual buildings. The City Center has an excellent record of maintaining its facilities. It would be a mistake to dismiss the possibility that the proposed building would be allowed to deteriorate but it seems unlikely. 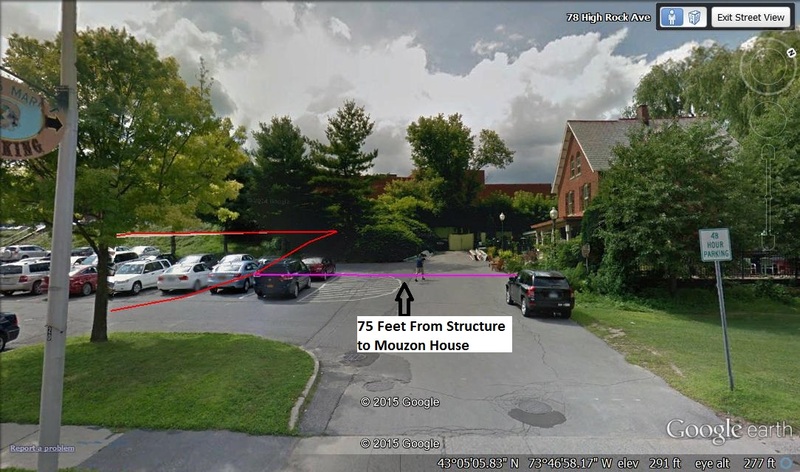 As the photos show, the Mouzon House will not be cheek by jowl with the proposed structure. The proposal includes a significant buffer to the street in order to plant trees as planned by the City Center. 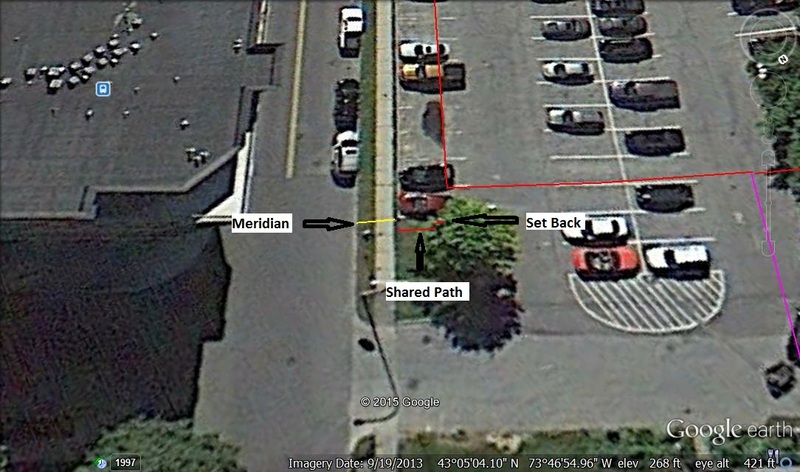 There is a ten foot grass median from the curb. There is another ten foot shared biking/walking path and then there is an additional three foot buffer between the path and the structure. There will not be an imposing prison like wall running along High Rock Avenue. It is important to remember that this parking structure will be built at no cost to the city with the City Center Authority paying for all operating and maintenance expenses as well. In addition the City Center will be paying an annual lease payment (currently proposed to be $70,000.00) to the city and the city will be receiving a share of the parking revenues (currently proposed to be half) as well as sales tax. 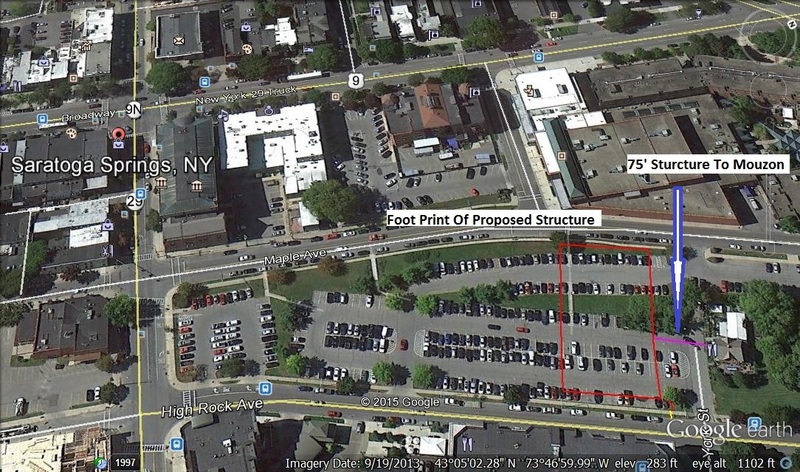 This is not to dismiss the current plan to issue an RFP for a multi-use structure. If the structure can accommodate the parking in the current proposal along with whatever additional parking that the new uses will require, this would be outstanding. I have expressed my skepticism about all of this coming together but time will tell. It is wonderful that people care so much about our city that this project has generated such interest and at times passion. I have been enormously impressed by the people I know from Sustainable Saratoga. The city is extremely fortunate that we have a group of such quality working on behalf of our city. I have also had many interactions with Mark Baker in the recent past. I have found him to be not only accessible and open but extremely well informed. I think that the city is fortunate to have him running our City Center. The point of this post is simply to argue that the proposed project has significant merits that should be considered in our discussions. I have to give credit where credit is due. I have gotten a draft copy of the RFP for the city parking lot. Mayor Yepsen moved right along in drafting something to go out. Proposals are due September 29th. I am reminded of the classic: Be careful what you ask for. The bid is to sell or lease the entire property between Maple Avenue (West), Lake Avenue (South), High Rock (East), and York Street (North). That is pretty much the whole enchilada of our available downtown, public property. This whole thing seems rushed. I have a number of immediate concerns. 1. The number of parking spaces in the proposed city center structure is 404. The structure will take up an area that now has 188 parking spaces leaving 263 parking spaces not affected. So if the City Center were successful we would have a total of 619 spaces. The proposal asks for a minimum of 600 spaces and clearly, there would be a need for additional spaces for the other mixed uses. It is important to note that a successful bidder would probably use up all the land so there would not be an opportunity to expand parking there in the future. 2. The RFP would involve either selling or leasing the city property. Do we want to sell this land so that it is permanently gone for other city uses? I am not sure, but it would seem to merit some thought before an RFP is issued. 4. Normally in doing RFP’s the developers are required to provide the earnest money which is meant to insure that they are serious and have some skin in the game to minimize later conflict. No such money is required in this RFP. 4. Related to item #2 and #3, shouldn’t the city do a market value survey to determine how much the land is worth. We have already gone through a painful battle over a previous land purchase and sale. Relying on the proposals from an unknown number of developers who are not required to put up any money creates an opportunity for speculation. Sonny Bonacio of Bonacio Construction, right, appears with with Joseph Masher, chief operating officer of Bow Tie Cinemas in this photo from Oct. 16, 2013. Bonacio is one of the contributors to the Saratoga Political Action Committee, which has raised more than $46,000 since being formed in June. SARATOGA SPRINGS — The Saratoga Political Action Committee, formed barely a month ago, has already raised more than $46,000 that it can spend to influence this year’s city elections. The group has raised far more than either the Republican or Democratic parties in the city, according to new filings with the state Board of Elections, putting it in a position to wield financial influence as elections approach. The major contributors include members of the Dake, Bonacio and Roohan families, all of whom have business interests in the city and long association with the local Republican power structure, though the committee had more than 200 donors. The entire City Council is up for re-election this year. Four of the five seats are held by Democrats. “Our goal is to encourage and support a balance between expanding economic opportunity and protecting our environment while enhancing the economic well-being and quality of life in Saratoga Springs and Saratoga County,” PAC Chairman Robert Manz said when the committee’s formation was announced. Manz, chief operating officer of the D.A. Collins Cos. and a city resident, couldn’t be reached for comment Friday afternoon. Not everyone, however, is happy about the PAC. A petition on the www.change.org website calling for candidates not to accept money from the PAC had 119 signatures as of late Friday. “PACs are the antithesis of grass-roots civic engagement and Saratoga PAC is an affront to the democratic process,” the organizer says on the website. – Bill Dake, chairman of Stewart’s Shops, has given $5,000, while his son Gary, president of the company, has donated $520, according to filings. – Michael and Linda Toohey have given a combined $5,000. Michael Toohey is an attorney who often represents developers before city boards, and represents the Saratoga National resort proposal; his wife is a former vice president of the Saratoga County Chamber of Commerce. – Alfio “Sonny” Bonacio, owner of Bonacio Construction, has given $5,050. – Roohan Realty owner Tom Roohan donated $1,000 each. – Various corporate entities associated with D.A. Collins Construction have given $6,500. The DeCrescente beer distribution family of Mechanicville gave $2,500, as did Jeffrey Vukelic, owner of Saratoga Eagle, the Saratoga Springs beverage distributor. The committee so far has spent just over $3,000, most of it the cost of a June 24 fundraiser at The Stadium Cafe. It has a balance available of more than $43,000. The money raised by the PAC dwarfs what the regular party committees in the city have raised in the first six months of the year. The Saratoga Springs Democratic Committee raised $7,310 in that time, and has a current fund balance of $4,856. The city Republican Committee raised $6,739, and has a balance of $6,990. Political action committees can work outside the political party structure to contribute money directly to candidates or issues they support. They’re common at the federal and state election level, but this is the first local PAC other than one for the Police Benevolent Association members. Hi John , the document is currently being prepared and near completion. As soon as the Council has had a chance to comment it will be released from the Accounts office for public review. All your questions will be addressed within the document. Thank you.